2015-2019 Mustang 2.3L EcoBoost, Automatic/Manual Trans. Rear Wheel Drive 2 Door, requiring EC-Type certification. 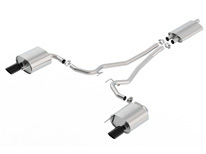 Does not fit convertible or four tip, active exhaust systems.